Fiddes Water Stain - Goosebay Sawmill and Lumber, Inc. Available in seven colors, Fiddes Water Based Stains are very light fast, penetrating colors that will enhance the grain of all woods. Fiddes Water Stains do not spread or ‘bleed’ into surrounding areas like many other stains. This characteristic is useful for matching sapwood color to heartwood, highlighting an area, or cutting an edge on separate panels of a cabinet. All colors can be mixed to create custom blends. 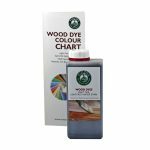 Moderate amounts of Fiddes Water Stain can be used to tint water-based finishes. Refer to a manufacturer’s recommendation for thinning. Application: Use a soft cotton cloth or sponge and apply in the direction of the wood grain where possible. Apply evenly, blending the stain over the whole surface area by exerting a degree of pressure when applying by hand. Water stain may also be applied by spray technique. Because these water stains are concentrated, you may find that one-half strength will be your most used ‘shop’ mix, providing versatility and economy. Thin with water for a lighter shade. On areas where exceptional evenness of color is required, a prior coat of Transparent Shellac thinned with two to three parts of alcohol can be applied evenly, left to dry for one hour, and then be followed by the application of water stain. The thinned shellac will act as a slight barrier and conditioner for the color work. Compatibility: All of Fiddes Durable Finishes (Clear Glaze, Danish Oil, Hard Wax Oil) are especially well suited for application over water stain and will enhance depths of color. Shellac can be applied by brush or spray over water stain. When using a brush, apply the first coat with a light touch so as not to pull any color. Propriety lacquer is generally suitable over water-based stain when sprayed. All lacquers, especially brushing lacquers should be thoroughly tested on a sample board to assure there is minimal tendency for dye color to ‘float’. Thinning and Conservation: Water is the appropriate thinner. All full strength or thinned water stain can be saved for future use. Reversibility: Wiping with warm water will remove some color. Denatured alcohol wipe followed by sanding will remove more color.